This car seems totally crazy, but the new Lamborghini Veneno Roadster made its bizarre public unveiling in Abu Dhabi on the deck of 240m Italian military aircraft carrier. The €3.3 million (£2.8 million) Veneno Roadster is a roofless version of the Veneno coupe, which was unveiled at the 2013 Geneva Motor Show, and is based on the Aventador. With its sharp, angular styling, the Veneno Roadster really looked at home parked among jet fighters. Thrust is provided by Lamborghini's standard mid-mounted 6.5-litre V-12 engine twinned with an ISR transmission, which produces 740 horsepower, a significant increase over the Aventador's 691 hp. 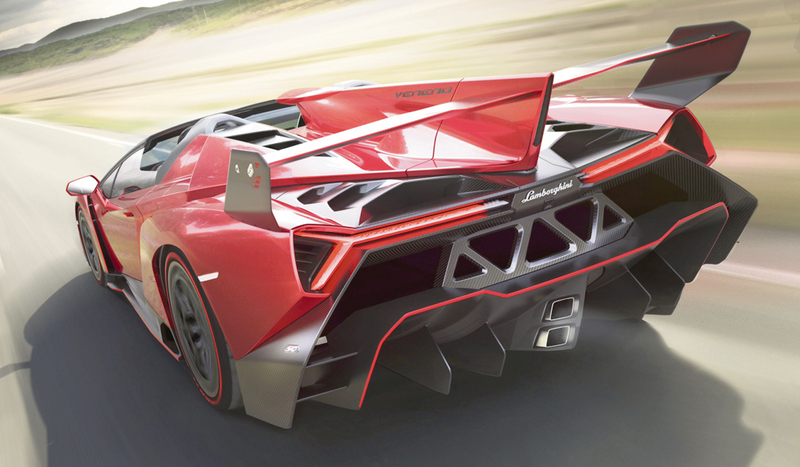 The extra power, delivered to all four wheels, makes the Veneno Lamborghini's most powerful production model to date. Lambo says both the coupe and roadster will do 0 to 62 mph in 2.9 seconds, and reach a top speed of 220.5 mph. Despite all that, the Roadster weighs a relatively petite 3,285, largely thanks to extensive use of carbon fibre. Lamborghini's new forged carbon production method cuts production time significantly. Only nine will be made. “The Lamborghini Veneno Roadster is one of the world’s most exclusive cars with the most extraordinary performance,” said Stephan Winkelmann, President and CEO of Lamborghini, commenting on the event. Lamborghini also has plans to open a new showroom in Abu Dhabi, which they hope will boost sales.